On September 24, the New York City Council announced two community hearings to be held by the Council Committee on Civil Rights in Brooklyn and Queens to provide the public with opportunities to submit testimony on the NYPD’s practice of stop, question and frisk. Communities United for Police Reform encourages all New Yorkers concerned about ending the discriminatory and abusive policies and practices of the NYPD to attend. 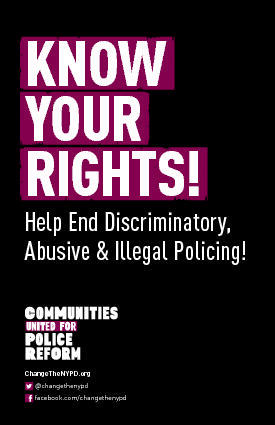 Communities United for Police Reform has released a new Know Your Rights booklet with critical information for New Yorkers to know when interacting with the police. On Thursday, September 27, CPR organized an Advocacy Day for NYPD Accountability and Community Safety at New York City's City Hall. On Monday September 24, Latino leaders, including Congressional, State and City elected officials, community, labor and faith representatives gathered on the steps of City Hall to demand reform of discriminatory policing practices in New York City including stop and frisk, call for passage of the Community Safety Act package of bills currently before the New York City Council, and encourage New Yorkers to attend the Rally and Advocacy Day for Community Safety on Thursday, September 27. Want to know more about the Community Safety Act? Watch this short video introduction created by CPR member NYCLU working together with Picture the Homeless, the Center for Constitutional Rights, Malcolm X Grassroots Movement, Streetwise and Safe, and the Muslim American Civil Liberties Union. CPR is holding a rally on September 27 to call for passage of the Community Safety Act. For more info, click here. In February 2012, CPR member The Bronx Defenders and Emery Celli Brinckerhoff & Abady LLP settled a federal class action requiring New York City to pay $15 million to approximately 22,000 New Yorkers who were illegally charged with violations by the New York City Police Department under unconstitutional “loitering” statutes between 1983 and this year. The NYPD continued to enforce these void statutes for decades after New York state and federal courts had struck down these laws in the 1980s and 1990s, on First Amendment and other constitutional grounds. Stop-and-Frisk Lawsuit - Been stopped and/or frisked illegally by the NYPD since January 2005? Oct 1, 2012 deadline to submit surveys if you have been unjustly stopped by the NYPD since January 2005! The Center for Constitutional Rights (CCR), a member of Communitied United for Police Reform, is currently litigating, along with its co-counsel, a federal class-action lawsuit called Floyd v. City of New York, challenging the New York City Police Department’s illegal stop-and-frisk practices. Read more about Stop-and-Frisk Lawsuit - Been stopped and/or frisked illegally by the NYPD since January 2005? On Thursday, September 27 Communities United for Police Reform (CPR) member, supporter and partner organizations will hold an Advocacy Day at City Hall to highlight the harm that stop-and-frisk abuses and related discriminatory policing practices have on communities. We will also be advocating for the passage of the Community Safety Act, a NYC Council legislative package reform package that aims to secure real NYPD accountability and transparency. Communities United for Police Reform (CPR) released the following joint statement today with 1199 SEIU, 32BJ SEIU, LatinoJustice PRLDEF, National Gay and Lesbian Task Force Action Fund, and the Retail, Wholesale and Department Store Union.